Home > Bacteria & the Gut > Which Bacterium Causes Typhus? Typhus is caused by several species of Rickettsia bacteria and it is important not to confuse it with typhoid fever, which is a severe infection caused by Salmonella bacteria. The disease typhus is actually several closely related diseases, which differ by the species of bacteria that cause them and also by the insect host that transmits them to humans. Epidemic typhus, the most common type, is caused by Rickettsia prowazekii and is introduced into the human body by the bite of human lice. The bacteria live inside the digestive system of the lice and enter the bloodstream of people when the lice insert their mouth parts to feed. The two other types of typhus are murine typhus and scrub typhus, Murine typhus is caused by the bacterium Rickettsia typhi and, as its name suggests, is transmitted by fleas that normally live on rats and mice, but that can bite and infect humans. Scrub typhus is caused by a different bacterial species, Orienta tsutsugamushi, which is transmitted by harvest mites that live on both humans and mice and rats. 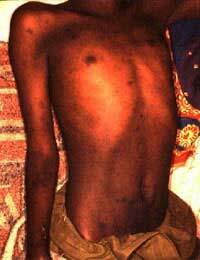 This last form of typhus is usually called spotted fever. Typhus is an illness caused by infections of the bacteria mentioned already. The name comes from the Greek word 'typhos', which means hazy and has been used to describe the disease, because this leads to a hazy state of mind in those affected. Mental processes become impaired, leading to delirium and stupor, because of the high fever that the bacterial infection causes, up to 106 degrees Fahrenheit. The fever is very difficult to shake off and commonly persists for about two weeks. The person with typhus feels generally very ill with headache and other aches, nausea, vomiting, abdominal pain and a dry cough. They may also develop a rash, which is a dull red spreading rash on the torso. The infection starts with the bite of an insect vector, which can be sore, but other symptoms generally do not start to appear for about 3 weeks. The fever begins suddenly and the original bite becomes ulcerated and scabs over. The lymph nodes nearest to the bite area also become swollen and the symptoms worsen for a period of 2 weeks. Typhus can be fatal, but if someone does recover naturally, this process may take a further three weeks. If no treatment is available, up to 60 per cent of people who develop typhus as a result of a Rickettsial infection will die. Fortunately, the condition responds well to treatment with antibiotics and prompt treatment usually leads to a full recovery in a much shorter time than natural recovery. Typhus occurs anywhere in the world that rats and mice or the other insect vectors live close to humans, and in places where sanitation and hygiene are poor. Like many infectious diseases, typhus is a disease of poverty, but areas in which it is rife are often visited by travellers and tourists, some of whom contract typhus each year. Mexico, South America, South east Asia and Central and East Africa have all reported large epidemics of typhus in the past and the diseases is always a risk in these areas. Typhus can occur in the US, particularly in the southern states, but it is relatively rare with only a few hundred cases at the most each year. The best way to reduce the incidence of typhus is to control the rodent population that carry the bacteria that cause it. If this has not been done, people should try to avoid rodents as much as possible. A DNA vaccine against the bacteria responsible is currently under development but until that becomes available, prompt treatment is vital. Treatment should be obtained sooner rather than later for mite or flea bites, or any of the early symptoms of typhus. As with many infectious diseases, the earlier the infection is diagnosed and treated, the more successful the outcome.